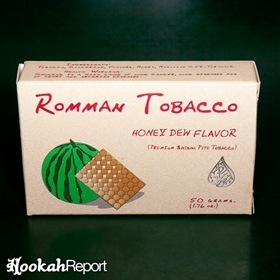 Romman Honey Dew is a medium cut, premium tobacco. Honey Dew is more slimy and juicy than other Romman flavors, which seems to produce a richer taste than some of their other offerings, however there also seems to be more stems present. 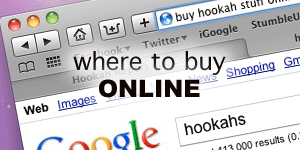 Romman tobacco is made by Hookah-Shisha.com who is the sole online distributor. However, Romman tobacco is sometimes available in local stores as well. 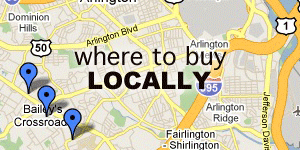 Check the local listings to see what’s available. This review was performed after many smoking sessions with various hookahs and bowl styles. Most recently it was smoked using a Khalil Mamoon 34” hookah and a HJ Alien Mini phunnel bowl. Honey Dew began smoking within a few draws. After five minutes of smoking, the flavor was rich and the smoke was dense. It’s unlikely to turn heads, but still surprisingly thick with minimal effort. The session lasted roughly an hour and a half after which time the smoke thinned and the flavor dramatically dropped off. Romman Honey Dew is not to be confused with honeydew melon. They are not the same flavor, though it’s clearly a play on words. Honey Dew is a melon-honey blend. The aroma is a strong honey smell, while the taste is a more mild honey flavor mixed with a distinct sweet melon. The flavor is warm and bright, but not so intense as to sap the enjoyment out. I admit, I’m usually not too big a fan of honey flavored tobacco. It’s usually an intense candy-sweet flavor. Honey Dew from Romman is not so. I was very impressed. The honey flavor is distinct but mild, mingling with the sweet-melon flavor better than I ever would have guessed. Imagine a beautiful woman falling in love with a total computer nerd for some reason other than his money. Sometimes unlikely individuals make awesome couples and this is just the case for Romman’s Honey Dew flavor. I would like to say that people who abhor honey flavors should stay away. But I’m usually one of those people and I’m hooked. My best recommendation is that those who like sweet-spice flavors may find this one pleasant. But I’d also have to say that people looking to give the honey a second go might want to put their money on this flavor.